Peak and Peak is all about fun! If you are near Western New York, check out Peek and Peak Ski Resort. This resort has activities for the entire family to enjoy. Peek and Peak is located in Clymer, New York. This resort is nestled in the mountains of Western New York just 90 miles from Canada and Buffalo, New York. It is 110 miles from Cleveland, Ohio and 150 miles from Pittsburgh, Pennsylvania. This resort is one of the best in the area and makes it possible to directly access the Chautauqua Lake Snowmobile Trail System. Peek and Peak Ski Resort has 27 trails. It has eight chairlifts making skiing convenient for everyone. They are proud of their new snowmaking equipment and during the ski season are open daily and nightly, seven days a week. In addition to downhill skiing, there is cross country skiing and snowshoeing. For family fun, snow tubing is a great activity to enjoy. Unlike other resorts, Peek and Peak offers a ride back up the hill for the tubers. For the snowboarder, Peek and Peak has three terrain parks. The parks are designed for all levels from beginner to advanced. Daily lift tickets can be purchased as well as season passes. There are discounts offered to children and seniors as well as group rates available. When the snow melts, spend the day on the greens. Peek and Peak has two golf courses, Lower Course and Upper Course. Both offer a challenge to any level golfer. The scenic views are breathtaking. If you want to brush up on your game, check out the Peak Academy. They offer personal golf lessons by a PGA Professional golfer. Relax and enjoy the resort's spa. After a long day on the slopes or the greens, treat yourself to something enjoyable. The spa features treatments and massages to make you look and feel great. They offer a full range of spa services to make you relaxed and pampered. Why not stay for the night? The resort has a wide range of accommodations from hotel rooms and suites to condominiums. Whatever your particular need or budget, you are sure to find it at Peek and Peak. They also offer packages combining both lodging and activities for one great price. The resort also features one of the area's most popular buffets - the Sunday Champagne Brunch. If you live in Western New York, or plan on visiting the area, Peek and Peak is one place you will want to visit. If you are visiting in the winter season, the skiing is worth checking out. 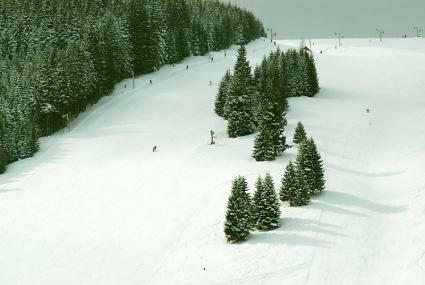 With its many trails and slopes, you will be pleased with the terrain as well as the activities offered off the slopes.